Print thousands of quality pages without interruption – at an extremely low cost per page. 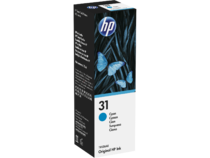 High-yield Original HP ink bottles are the perfect match for high-volume printing. Add ink when you want and count on HP premium quality and reliability.